Editor’s note: This guest post is written by Vivek Wadhwa, an entrepreneur turned academic. He is a Visiting Scholar at UC-Berkeley, Senior Research Associate at Harvard Law School and Executive in Residence at Duke University. Last week, he wrote about the need to lift restrictions on H1-B visas. Follow him on Twitter at @vwadhwa. I’ve got a message for all the Silicon Valley venture capitalists who think a CEO is over the hill after age 40. 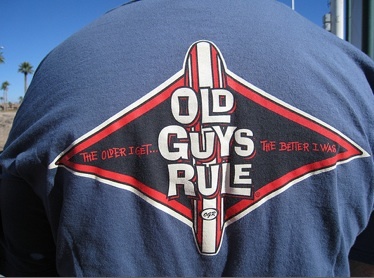 Old guys rule. And they are far more likely to be the founder of a successful technology company than most of you understand. How do I know this? Research that my team conducted, based on a survey of 549 entrepreneurs in high-growth industries, showed that the average founder of a high-growth company launched his venture at age 40. We also learned that these founders are likely to be married and have two or more kids. They typically have six to ten years of work experience and real-world ideas. They simply got tired of working for others and wanted to rise above their middle-class heritage. These clearly aren’t the talented 20-somethings who have “great passion” minus the “distractions like families and children…that get in the way of business” which Sequoia Venture’s Michael Moritz raves about (also in this Building 43 video). Or the ”very low paid” young entrepreneurs who, according to Google’s Eric Schmidt, make “all the right things happen” by “working themselves to death”. But these are the companies which Silicon Valley VC’s seem to flock to. And maybe that’s one reason why the failure rates of VC investments are so high. I have a few theories about why VC’s favor the young. First, VC’s tend to travel in herds. For the last decade, the herd has been all about the Internet. And Internet startups require a lot less sophistication and coordination than, say, a telecom gear startup, an enterprise software startup, or a biotech startup. Everything from the product development processes to sales processes are far more complex for these types of products. I also think that in its Web 2.0 infatuation, Silicon Valley has probably funded a huge number of companies that are really features and not companies. It’s very easy to build a feature and call yourself a CEO. It’s much harder to actually grow a company, something that, according to my research, old guys appear to be better at. Secondly, and this is speculation but I have some personal experience in this area. Younger CEOs are probably easier to push around. Wet-behind the ears and inexperienced, young CEOs are probably far more likely to sign onerous term sheets out of sheer gratitude for getting funded. Old guys know better than to sign a term-sheet loaded with a nasty double-trigger option acceleration that would consign the founders to indentured servitude for years after a liquidity event. Lastly, it could be that VC’s share Schmidt’s stated belief that young entrepreneurs don’t like the hassles of running big companies so they’ll let VC’s bring in adult management. I don’t know if this is the reality, but I do know that the old guys are different. A paper by my team, which the Kauffman Foundation will publish this month, finds that only about a quarter of the (old) founders of the venture backed companies we surveyed ranked the advice of their investors as really important. (Nearly all valued the money, though). So VC’s may be just going where they think they’re most wanted or where they can most easily have their way. Can young guys start and run good companies? Absolutely. Larry and Sergey have done quite well, thank you. But a sheepskin that’s still wet is hardly any indication of superior leadership capabilities. Word to the wise. Discount the old guys at your own peril. I am a living example of the “old guys rule more than you think” reality. I launched my second company at age 39. I built a solid enterprise software company and was no spring chicken fresh out of Stanford with an MBA or CS degree in tow. And I know I’m not in the minority.